Marilynne Robinson has 1 media appearance. The Pulitzer-prize winning author, Marilynne Robinson, will visit both Gonzaga University and Auntie’s Bookstore this February. The Sandpoint, Idaho native has written numerous novels and essays over her storied career, while splitting her time between her craft and teaching at the Iowa Writer’s Workshop. Those familiar with Robinson will most definitely know of the fierce intelligence and depth contained in her writing. With her first novel, Housekeeping, in 1980, Robinson made a mark on the literary community and received critical acclaim. She did not write her second novel until 2004 (Gilead), which promptly won the Pulitzer for fiction. Between novels Robinson wrote several volumes of nonfiction, including a book on nuclear pollution and The death of Adam: Essays on Modern Thought. Marilynne Robinson’s visit to Spokane, made possible by Gonzaga University, is a rare treat for literature lovers and is an event not to be missed. Meet Pulitzer Prize-winning author Marilynne Robinson as she reads from her new novel Lila. Share this event on Facebook! Are you 13-18 years old and have an idea for a young adult novel or are you just curious about the genre? Bard college students will lead a workshop for aspiring teen writers using excerpts from Marilynne Robinson's novel, Housekeeping, as a springboard for their own writing around character, landscape, and plot. Admission: FREE - Participants are asked to bring a notebook and a pen or pencil. This event is presented by Bard Center for Civic Engagement as part of the 2014 Big Read. The Big Read is a program of the National Endowment for the Arts, designed to revitalize the role of literature in American culture and to encourage citizens to read for pleasure and enlightenment. Purchase & Download the e-book Here! This BIG READ Book Discussion is presented in partnership with Bard College Center for Civic Engagement and will be led by two distinguished Bard professors - Deirdre d'Albertis, Professor of English & Literature Program Director & Mary Caponegro, Richard B. Fisher Family Professor in Literature and Writing & Codirector, Written Arts Program. The event is FREE and open to all who wish to participate. A modern classic, Marilynne Robinson's Housekeeping is the story of Ruth and her younger sister, Lucille, who grow up haphazardly, first under the care of their competent grandmother, then of two comically bumbling great-aunts, and finally of Sylvie, their eccentric and remote aunt. The family house is in the small Far West town of Fingerbone set on a glacial lake, the same lake where their grandfather died in a spectacular train wreck, and their mother drove off a cliff to her death. It is a town "chastened by an outsized landscape and extravagant weather, and chastened again by an awareness that the whole of human history had occurred elsewhere." Ruth and Lucille's struggle toward adulthood beautifully illuminates the price of loss and survival, and the dangerous and deep undertow of transience. Marilynne Robinson is the author of the bestselling novels Home, Gilead (winner of the Pulitzer Prize), Housekeeping, and two books of nonfiction, Mother Country and The Death of Adam. She teaches at the University of Iowa Writers' Workshop. Purchase & Download the e-book Here! Join Sarah and Brian C. the last Sunday of every month as we use wonderful books to travel the world. We are currently discussing books in the Latin American fiction genre, and this month we are reading Housekeeping by Marilynne Robinson. 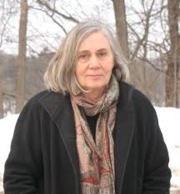 Marilynne Robinson has written three highly acclaimed novels (Housekeeping, Gilead, and Home) as well as two works of nonfiction (Mother Country and The Death of Adam). Gilead won the both the National Book Critics Circle Award and the Pulitzer Prize for Fiction. Critic Michael Dirda describes the novel as “so serenely beautiful, and written in a prose so gravely measured and thoughtful, that one feels touched with grace just to read it.” Robinson is highly sought after as both an essayist and a public speaker and is revered by a generation of young writers for her difficult but ultimately consoling advice on writing and living as a writer. Marilynne Robinson's book Home was available from LibraryThing Early Reviewers. Marilynne Robinson is currently considered a "single author." If one or more works are by a distinct, homonymous authors, go ahead and split the author. Marilynne Robinson is composed of 4 names. You can examine and separate out names.